via Save the Quail | Golden Gate Audubon Society. Quail are so charismatic! No surprise that they are the California State Bird! They are also the perfect poster bird for efforts to restore native bird habitat in Golden Gate Park. But I think the environmental history of the California Quail in Golden Gate Park is quite a bit more complex than the foregoing teaser implies. The starting point for anyone interested in understanding the fluctuations of quail populations in Golden Gate Park would be A. Starker Leopold’s book: The California Quail (University of California Press, 1977). 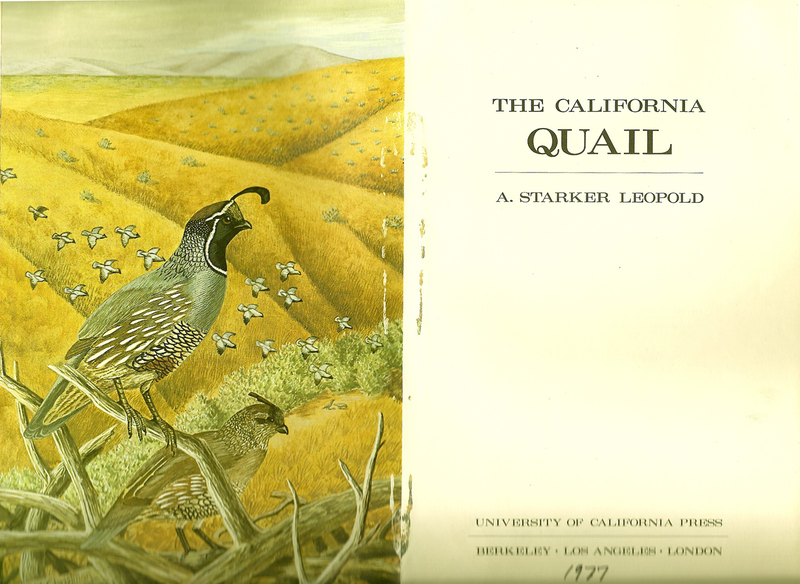 Leopold was a professor of zoology and forestry at UC Berkeley and his book is now widely regarded as a landmark ecological study and remains the definitive study of quail in California. In the book Leopold explains the historical fluctuations of California Quail in relation to impacts on their native habitat due changes in land use, as well as massive intentional interventions on the part of humans wanting to perpetuate them as a prized game bird. Most interesting to me, in regards to quail in Golden Gate Park, is the fact that the quail population in California peaked between 1860-1895, the era of “settlement and crude agriculture” in California, which provided a temporary increase in the type of habitat that quail thrive in: clearings rich in seed-bearing forbs (introduced Mediterranean species) that were perfect for quail foraging, lots of brush remaining around the edges and along riparian corridors and offering cover from predators, and plenty of trees remaining to offer safety and roosting. Coincidentally this was just when Golden Gate Park was being developed. And the park landscape was also designed (unintentionally) to be attractive to quail, providing a similarly ideal landscape in those years. It was definitely an improvement on the dunes that previously dominated the Outside Lands and did not harbor many quail (if any). It seems that the artificial landscape of Golden Gate Park supported a bloom in the quail population in San Francisco, mirroring what was happening in the state in general in the late nineteenth century. In both cases the bloom in quail population was related to introductions of non-native plants and human-induced changes in habitat. But then Golden Gate Park continued to support an abundance of quail even as the birds began to decline elsewhere in the state. By 1935, when E.L. Sumner Jr. published “A life history study of the California Quail, with recommendations for its conservation and management,” (Calif. Fish & Game, 21:167-253, 275-342), quail in California were in marked decline due to a number of environmental factors, including the increasing dominance of invasive annual grasses (which are not a food source for quail), a result of overgrazing by live stock. Yet, in Joseph Maillard’s book, Birds of Golden Gate Park (1930), quail are referred to as “abundant” in the park. It seems that at that point, the environmental history of quail in Golden Gate Park diverges significantly from the environmental history of quail in the state as a whole. But I lose the trail there. I would love to know the rest of the story . . . why did quail persist in the park and then what actually happened in the park to reduce the quail population so drastically at the end of the twentieth century? If anyone has documentation of this chapter in the park’s natural history, please let me know! This entry was posted in history, urban ecology, wildlife and tagged birds of golden gate park, golden gate park, golden gate park history, native plants, urban ecology, urban parks, urban wildlife. Bookmark the permalink. Thanks for telling this story, which is not well known. The Audubon Society and its allies are under the mistaken impression that planting more native plants will benefit quail. As you report, the quail population in California increased as a result of the agricultural and grazing practices of Europeans. In other words, the quail population benefitted from non-native plants. The lack of understanding about what quail need is one of many mistaken assumptions of the native plant movement in the Bay Area. It is similar to a costly mistake made by the California fish and game department in the 1930s when the quail began to decline in California. Their response was to kill hundreds of thousands of animals who were perceived as predators of the quail. This pointless effort persisted over a period of 25 years without benefitting the quail population. This story, as told by A. Starker Leopold in his book, is reported on the Million Trees blog: http://milliontrees.wordpress.com/2011/02/07/exterminating-animals-a-waste-of-lives-and-money/. I can’t answer your question about why the population of quail in San Francisco has declined recently, but I believe that Leopold’s book gives us clues. It is the loss and fragmentation of habitat that reduce quail populations in California and that is certainly an accurate description of San Francisco. 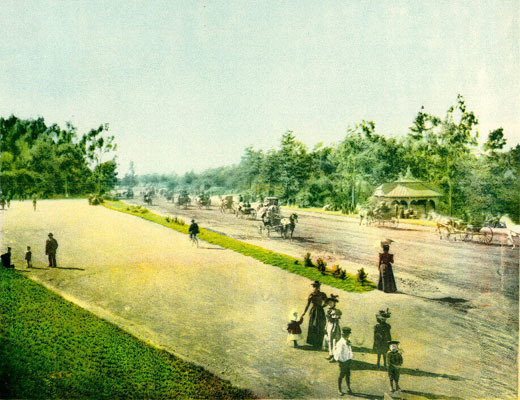 The development of Golden Gate Park precedes the development of the Sunset District. As the city became more densely populated, it restricted the movement of quail and the availability of the food and cover they need. If I remember Leopold correctly, the range of quail averages about 5 miles. Clearly there is not 5 miles of unrestricted habitat for quail remaining in San Francisco.